“Compost just happens” and it is not necessary for the gardener or recycler to know how or why. Action on the composter’s part to control the pH during composting is not normally necessary provided the process remains aerobic; you can just add the Greens and Browns (See Compost C: N Ratio) to the bin and leave them until they are turned into compost. However a greater understanding of the process can add to the enjoyment of composting and regularly and checking the pH during can enable the composter to monitor the process of decomposition. The pH levels in a compost bin will vary throughout the aerobic composition process as the microorganisms act on the material, it will also vary in different parts of the bin unless the material is regularly mixed. If anaerobic decomposition occurs and the contents start to turn black, wet and smelly, it will become more acidic due to the production of organic acids. Most finished composts are about neutral pH within a range from 6 – 8. 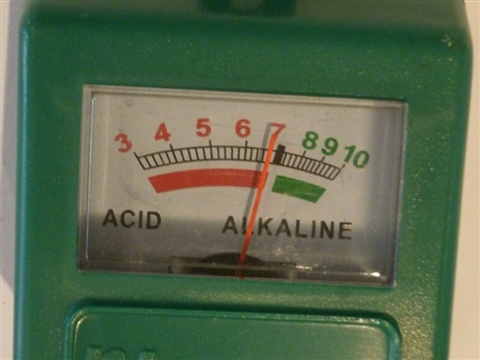 However, the initial pH of home compost, being made with the usual mix of vegetable trimmings, food waste and other household compostable material, is likely to be more acidic perhaps between 5.0 and 7.0. If a significant proportion of the material being composted is wood shavings or peat moss, perhaps from chicken bedding, the pH may be as low as pH 4.5. If the has been collected and stored to be added with other waste in a hot composting system and has started decomposing anaerobically e.g. in a heap of grass clippings, the anaerobic organisms will have produced acids lowering in the pH. The initial pH of composts will be more alkaline, with a pH as high as 8.5, where the material contains a significant proportion of manure or wood ash. Compost microorganisms grow and multiply within the pH range of 5.5 to 8. Organic acids are formed in the initial stages of the aerobic decomposition process and these acidic conditions favour the growth of fungi and the breakdown of lignin and cellulose. This means that if the initial pH of the material was six or seven it may fall due to the formation of these acids during the initial stage of the decomposition. Where the initial pH is 5.0 or 5.5 the pH remains relatively constant during this period. It is during these initial slightly acid conditions that the activity of composting microorganism causes the compost temperature to increase rapidly during the first few days and with it, the pH begins to rise, as the organic acids become neutralized giving mature compost generally a pH of between 6 and 8. In addition to the initial microbial activity, compost can also become acidic when there is insufficient oxygen and the microbe activity becomes anaerobic. This may be due to having too many nitrogen rich greens in the bin e.g. grass cuttings, or lack of aeration. 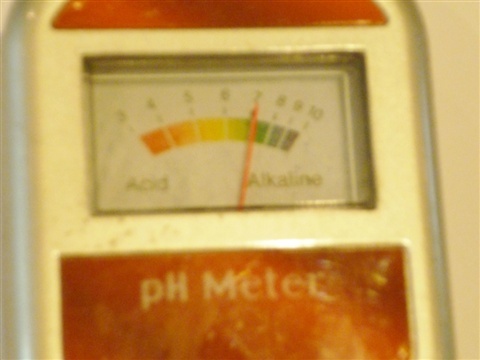 The compost pH will become neutral or alkaline as it matures pH values of less than six and above eight may indicate a problem with the composting process or the source materials. If you use maturation bin and have been monitoring the pH during the composting process continue to take readings until completion of the maturation process. Cooked food waste is normally home composted in a closed vessel with the addition of a bulking agent such as wood chip. The compost bin may be designed to take waste food or a combination of waste food and garden waste. I have used a number of food composter without encountering any problems. However, there have been odour problems reported associated with low pH. The unpleasant smells often occur when the pH is below 6.0 with high-odour group DNA sequences, similar to those of anaerobic or facultative anaerobic species being detected rather than the typical thermophilic composting species found in well functioning aerobic composing. High-odour compost heaps also contained Lactobacteria and Clostridia species of bacteria know to produce unpleasant odours. In the case of pH, samples can be removed from the bin and combined to give a single sample. If a pH meter is being used which will give a direct result each individual sample can be recorded. If taking a number of direct readings record and add each one to the graph separately rather than take an average of the readings. It is advisable to take a number of readings on each occasion preferable from the same area within the composting material on each occasion. pH can be measured using any of the following methods. Whichever method you choose, make sure to measure the pH as soon as possible after sampling so that continuing chemical changes will not affect your results. pH papers can be purchased coving different pH ranges are classified universal covering the whole range from pH 1 to 14. Strips are also available covering smaller ranges and 4.5 or 5 to 10 is ideal for testing compost as it is easier to distinguish between slight differences in colour. Laboratory grade test strips (available on the internet) are more accurate than those sold in garden centres. If the compost is sufficiently moist, it should be possible to take a direct reading by inserting the end of the strip into the compost for a few minutes to absorb the water to give a reading. However, it is better when using a test strip, chemical dye and some meters to mix the compost with distilled water or a buffer solution, (some suppliers recommend rainwater but stored rainwater might be effected by the storage vessel or contamination). It is important not to use tap water as this may skew the results, although my water gave readings using the two probe meters of 6.8 today. When using the test strips it is suggested that the hands are washed with some of the compost if it is intended to handle the sample. This is not necessary if an extraction tool or scoop is being used to collect the compost sample, as it should not come into contact with your hands. Take a small sample of the compost and wet it thoroughly with distilled water in a tube or beaker. A small test tube enables the compost to be mixed by shaking while a beaker may require mixing with a stirring rod. Dip the end of the test strip to the compost mixture and wait for the colour of the strip to change. The pH can then be determined by using the colour chart provided with the strips. 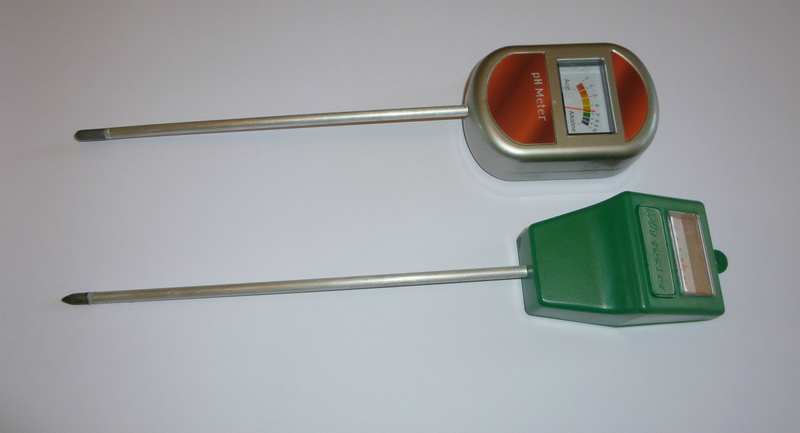 A number of different soil/compost pH meters are available. I have three meters, two are cheap meters purchased from garden centres and the third is a more expensive model. The cheaper models have a long metallic probe while the more expensive pH and moisture meter has a shorter cone shaped probe. Although this is more expensive than the garden centre models it falls within the category of a "field test” instrument suitable for economical testing rather than expensive laboratory kit. It also offers the opportunity to record the moisture levels of the compost. 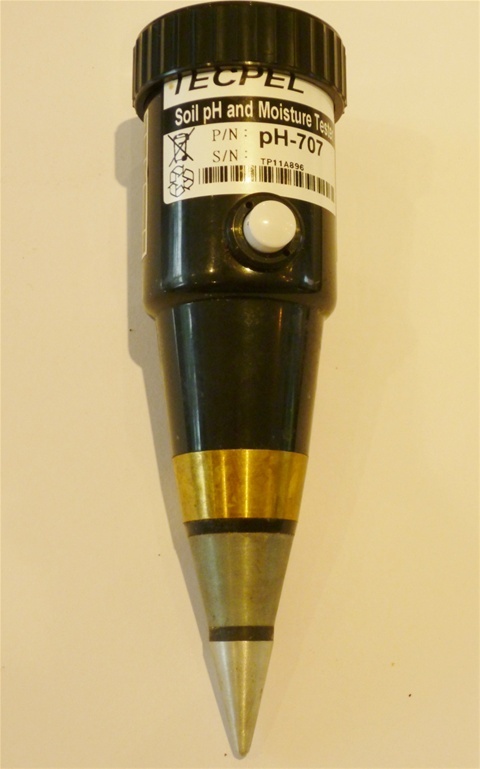 The instructions with the garden centre models are that the lower 100mm probe (but not its dark tip) is lightly shined using fine abrasive paper before use. The instructions with some suggest that you insert this directly in the moist soil or compost , twisting the tester between the fingers several times to ensure that the compost is well distributed over the surface of the probe. The probe that can then be inserted into the compost/ water, and the pH can be read directly from a display. For increased accuracy, it is recommended that the compost be mixed with distilled water or buffer and the reading taken of the water solution after a minute in contact. After the reading is taken, the tester is removed and cleaned with a cloth or tissue. 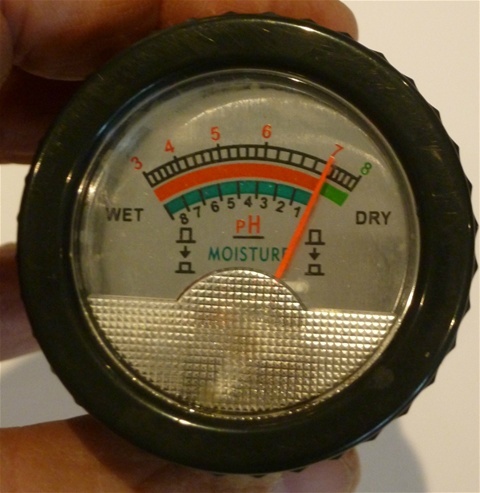 The 707 pH and Moisture Tester is used in a similar fashion. It detects the micro electric current between the metals in the probe to measure the pH content and moisture level. This equipment must not be used for testing liquids, as these will damage the meter readers should therefore be taken by simply insert the probe into the compost. coloured dyes are mixed with the compost water and the resulting colour is compared to chart to read the pH level. 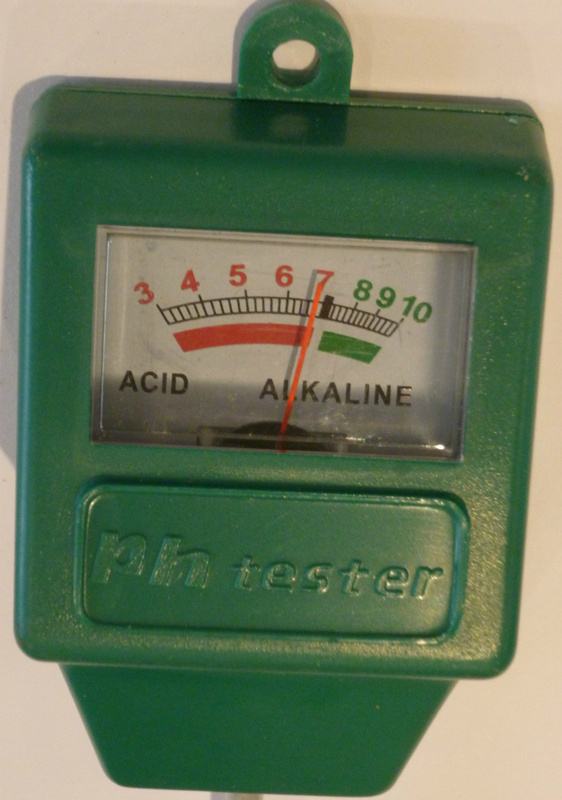 If using a test kit to measure pH I also tend buy a kit which also to measures the N, P and K levels. 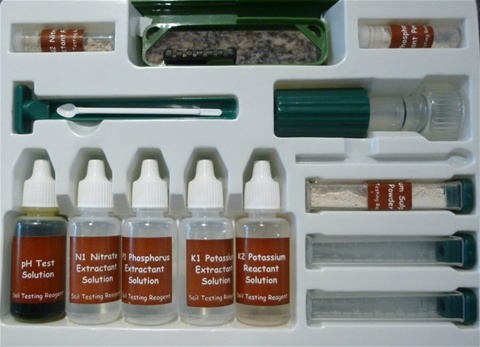 These test kits normally contain a test tube, some testing solution and a colour chart. The one illustrated also contains an Auger to enable easy and relatively consistent collection of the sample. If taking soil samples it is necessary to remove the top 5cm of soil and to break up the soil underneath. In the case of a compost samples the sample material should be loose already and the samples will be taken from different parts of the bin. The material should be collected and be allowed to dry naturally in a sample pot. When dry the sample is transferred to one of the test tubes provided up to the 1ml mark. One spoon (provided) of barium sulphate is added followed by the pH indicator solution up to the 2.5ml mark. The tube is capped, shaken and left for ten minutes. 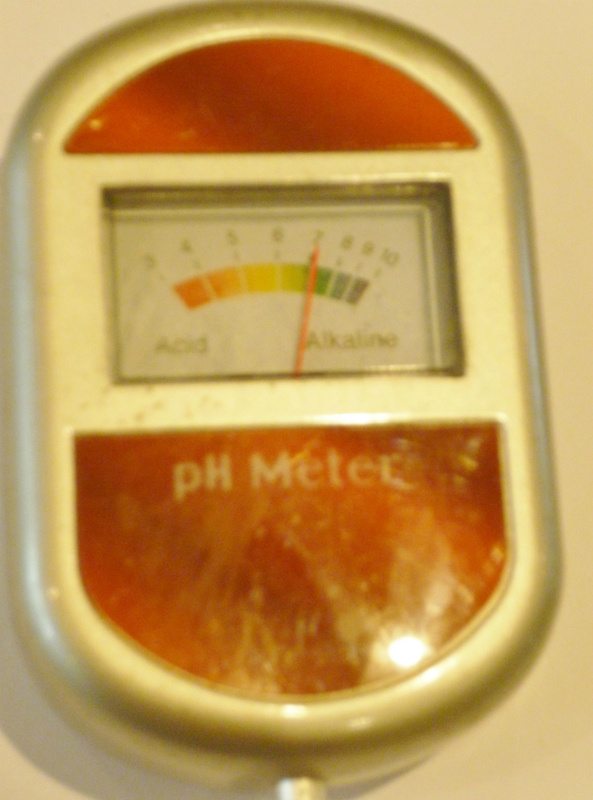 The solution in the tube changes colour according to the pH of the compost sample. The colour is then compared with the pH-reading chart. 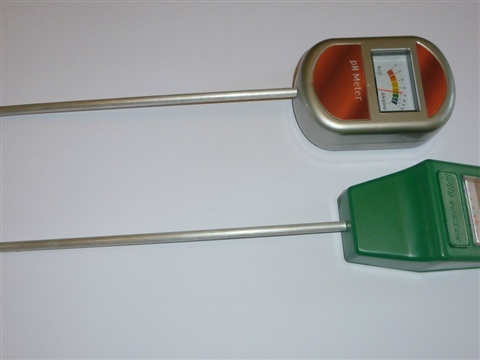 There are more technical methods of measuring the pH of compost such as using weighed oven-dried samples that have been reconstituted with distilled water. Alternatively, samples that have not been dried but to be accurate it will be necessary to compensate for the varying moisture content of the compost, which will require measuring moisture content.